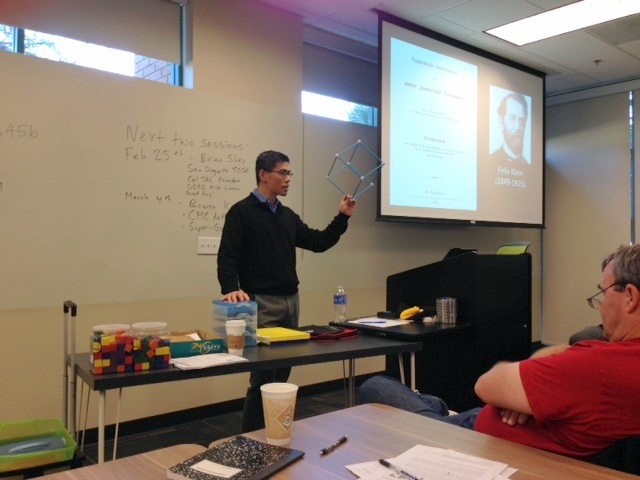 Darryl Yong explains the use of manipulatives for teaching geometry at MfA SD’s Teacher Leader Collaborative Jan. 31. On most days, you’ll likely find Darryl Yong, the well-regarded mathematics professor at Harvey Mudd College, teaching Ordinary Differential Equations or Numerical Analysis to math undergrads. But Yong also knows a thing or two about what it’s like to teach high school mathematics. In 2009, while on sabbatical from his post at Harvey Mudd, he opted to teach math for a year at Helen Bernstein High School in Los Angeles. 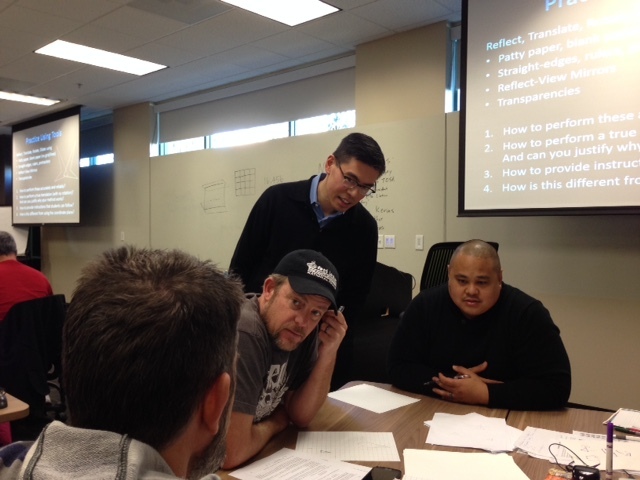 So when he graciously accepted the invitation to lead the Math for America San Diego Teacher Leader Collaborative last month, he brought with him his university-level mathematics knowledge along with a working knowledge of what it’s like to teach in a high school classroom. Launched in October, Math for America San Diego’s (MfA SD) Teacher Leader Collaborative (TLC) is a two-year professional development program designed by MfA SD. It is supported by the San Diego Unified School District (SDUSD), UC San Diego’s Department of Mathematics, UC San Diego Extension and the CREATE STEM Success Initiative at UC San Diego’s Center for Research on Educational Equity, Assessment and Teaching Excellence (CREATE). Yong’s session was the fourth in a series of eight daylong mathematics leadership workshops hosted for SDUSD secondary mathematics teachers. 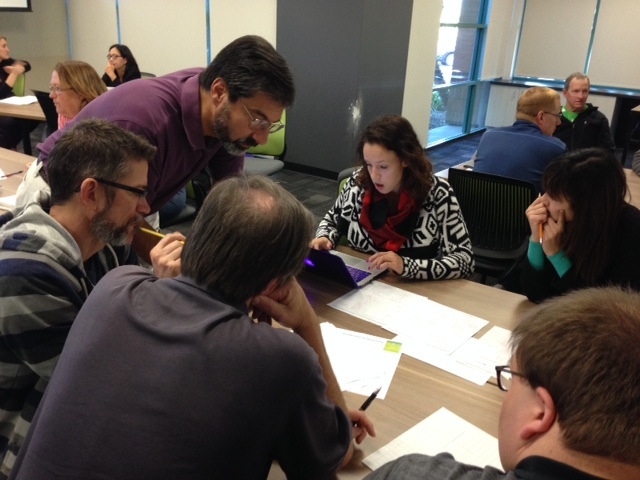 Forty–one teachers from more than 12 district middle and high schools attended. Yong focused on transformational geometry and the mathematical practices of the Common Core State Standards-Mathematics. Teachers worked in groups on a series of challenging problems in the morning and then spent the afternoon discussing the implications for their instruction. 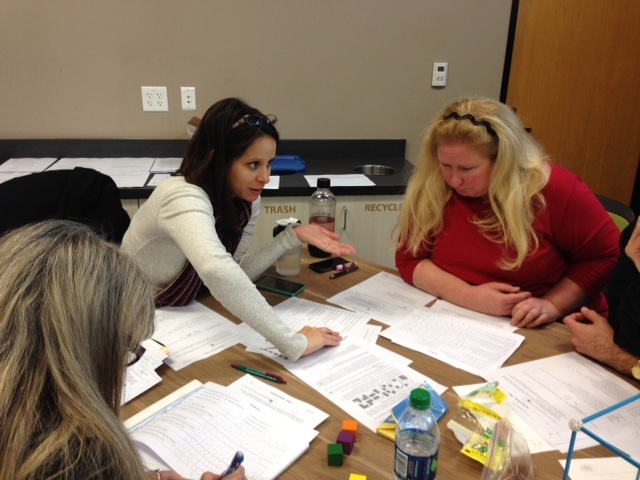 TLC teachers compare approaches to a geometry lesson. Secondary mathematics in the San Diego Unified School District is now a sequence of classes that interconnect algebra and geometry, beginning with Math 8 in eighth grade and continuing with Integrated Math 1, 2 and 3 in high school. Yong helped teachers learn how geometry has changed in the Common Core by placing them, once again, in the role of learners of mathematics. The day’s instruction consisted of a series of tasks aimed at helping teachers experience the value of looking for and making use of structure in mathematics – one of the Common Core’s eight standards for mathematical practice. Yong discusses problem sets with TLC teachers. Yong provided a brief analysis of the textbooks SDUSD teachers use and what the role of transformational geometry is in each one. “Darryl was great at pointing to specific spots in the sequence of textbooks that are highlights so teachers won’t miss the big ideas running through Math 8 and Integrated Math 1, where the bulk of geometry is taught,” said Ovie Soto, TLC director and MfA SD senior associate. Yong explored the power of manipulatives like patty paper, which leaves a white mark on folded areas, and MIRAs, used to help students understand the concept of reflections. These objects help with geometric thinking and learning. With colored cubes, a chessboard and coloring grids and triangles, teachers learned how activity manipulatives can help students come up with theorems. Teachers from Mira Mesa High School’s mathematics department review new transformational geometry postulates within the Common Core that differ slightly from those in traditional Euclidian geometry. These include concepts of translation, reflection and rotation as a means for proving theorems. Now at the program’s halfway mark, Soto sees the development of a community of mathematics learners and leaders taking shape among the TLC teachers. The next TLC session leader is Brian Shay, MfA SD mentor fellow, mathematics teacher at Canyon Crest Academy and board member for the College Board’s SAT Subject Mathematics Test Development Committee. The session is February 25. Bowen Kierns, a coauthor of mathematics textbooks used by SDUSD, will lead the session on March 4. For more information about Math for America San Diego’s Teacher Leader Collaborative, contact Ovie Soto at osoto@ucsd.edu.